These day dresses aren't full on bright and floral but they will get you out of your dark funk and in the mood for spring. The start of the new year is a funny time. You expect it to be fresh and bright when it's actually dull and cold. We are still in the depths of winter; the worst weather is yet to come. But, while we layer up in jumpers and thick tights and boots suitable for slippy footpaths, we dream of the good times to come. Don't deny it, we've all got our fingers crossed that we'll have a repeat of last year's summer in 2019. But, we've got to get through the rest of winter and spring before we reach that period of inevitable disappointment. There is, of course, always hope. And you can dress for the season, despite the weather, if you know what I mean. We're feeling optimistic today, and our wardrobes cannot handle any more winter clothes joining the ranks. So, we're planning ahead. We're seeking out new-season spring dresses that will get us in a sunnier mood. The 'spring' dresses available at the moment aren't your typical floral fare. 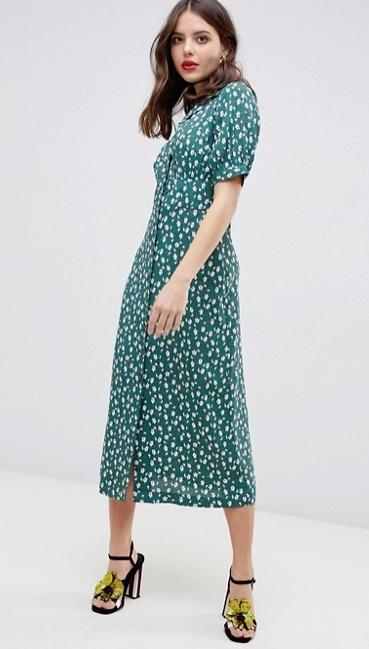 Most of the new season dresses are still muted of tone and totally wearable with tights, which we're are perfectly ok with as it means we can wear them now, with a big cardi, if we like. The only rule we have, though, is that they're not black. Or brown, navy or grey. Spring dresses need an element of colour about them. If the colour tone is soft, so be it. Are in the mood for shopping for spring? Any of these cute day dresses catch your eye?